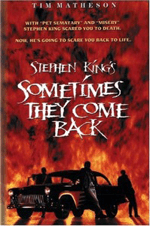 In the movie Stephen King’s: Sometimes They Come Back, Jim Norman’s brother died in 1957 after being stabbed by a gang of greasers. In 1974, Jim returns to his hometown to teach at the local school. After the death of one of Jim’s students, a new student arrives in town. The new student looks like one of the greasers that killed Jim’s brother but he couldn’t possibly be the same boy, as he looks the same age as the young gang member did in 1957. Weird coincidence or do they sometimes come back?